The study showed that by directly connecting the patient’s brain to a computer, that computer could be controlled with up to 90% accuracy – and that was done even with no previous training. 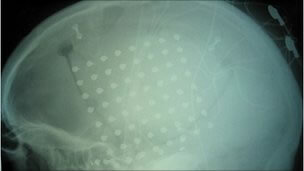 The technique involves placing electrodes directly onto a patient’s brain to record electrical activity; it’s called electrocortiography (ECoG). Unlike EEG that involves wearing a cap on the head to pick up signals outside the skull, electrocortiography involves a surgical procedure to place a plastic pad containing several electrodes under the skull to tap directly into the brain’s cortex (the outermost layer of the brain). Four patients who had previously undergone electrocorticograph implantation in order to establish the source of incurable epileptic seizures were also used in this study. They were told to think of four different phonemes – “oo”, “ah”, “ee” and “eh” – and then their brain signals were recorded. The results showed that the higher-frequency signals could reliably move a cursor on a computer screen. Dr. Leuthardt called the study one of the earliest examples of “reading minds.” Since the study successfully showed what microscale ECoG recordings mean, and where, then future operations to utilize this technology would only need to use a very small and minimally invasive implant. The surgery might need to require an opening less than a centimeter wide to insert the implant on the speech intentions area of the brain. This is very exciting since even by using EEG and “skull” caps combined with the power of thought have shown the ability to guide electric wheelchairs, steer cars, and play video games. This could take an “I think I can” positive attitude to new amazing heights!